Days are now remarkably chillier here, but after an incredibly kind September, I now feel ready to cover up and embrace the season of hot chocs. No reason to walk bare-legged for me anymore, because how awesome are these jeans that Bethnals specifically customized with the blog's initials for me?! Can't quite get my arms down over them, and as always I'm wayyy more comfortable in oversize silhouettes, so these jeans are just perfect! Absolutely an October favourite as well as the fact, that we are now in Apple season! Woohoo! Having grown up in a house with a garden that held several lovely and fruitful apple trees, my mum has brought me up celebrating Autumn with picking apples in the garden and creating the most delicious things in the kitchen afterwards. As I write, I have just cooked up some Braeburn apples to create a traditional Danish apple cake, we would always make at home at this time of year. It makes for a perfect Sunday here at home in London, perhaps I'll post the outcome on instagram later! WHAT ARE YOUR AUTUMN FAVOURITES, I WONDER? HOPE YOU'RE ENJOYING IT TO THE FULLEST! You look so gorgeous ! Nice pictures too ! Fabulous outfit! Masculine perfection head to toe! Love this look!! The jeans look fabulous! This color look it is perfect for october! Love it! Love the outfit. The photos make me feel like its still summer, which sadly it isn't! Also I love how you are wearing a pink shirt - you are looking great! love your bag...and your blog. You're so crazy cute that no matter what you wear it always looks nice! :) But I like the outfit as well, by the way! :) Pink looks very good on you! This pink blouse looks so good on you! Great styling! WIN any watch you like from Cluse, enter the Giveaway on my blog! you make mum jeans look so hot! 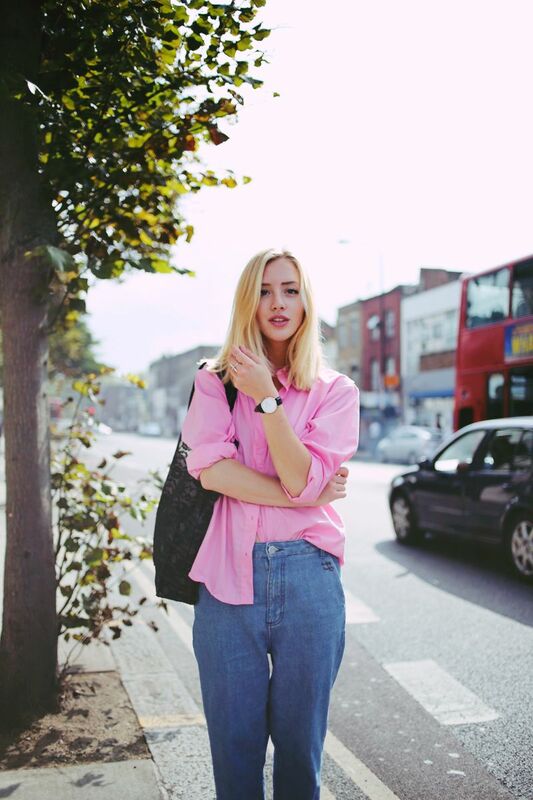 amazing outfit....lovely pink shirt+jeans+ heels combo!!!!! very nice look! love the pants! Those jeans are a gorgeous, unique shape! Love the pink and the blue! Pretty pictures! Perfect London look! I love your outfit. Looks amazing, the pink really adds some good color!